of Rajasthan Police Services while conducting Combined Competitive Exam. Last date of online submission of application form for this Rajasthan PSC Police Sub Inspector, Platoon Commander jobs Combined Competitive Exam. 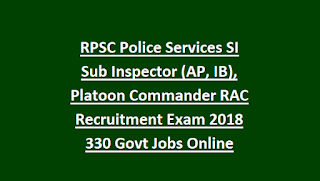 The selection for RPSC Police Sub Inspector, Platoon Commander Jobs Recruitment 2018 is will be in three different stages. Candidates can apply online @rpsc.rajasthan.gov.in. Last date to apply online is 08-08-2018 for this RPSC SI Jobs. For more details regarding physical efficiency tests, Physical standard test, age limits, exam syllabus, exam pattern, educational qualifications and more information regarding RPSC Police Sub Inspector SI, RAC Platoon Commander Recruitment please see the details given below information. Download official notification of Rajasthan Police Sub Inspector Recruitment. There are total 330 vacancies available in Rajasthan Police Services through RPSC Combined Competitive Exam. The candidate should be hold a Degree from recognized university under UGC Act 1956. Candidate must have Working knowledge of Hindi written in Devnagari Script and knowledge of Rajasthani Culture. As on 01-01-2017 age limits are 20-25 years and for SC/ST/OBC/BC Male and General Female Candidates upper age limit is 30 years. For reserved categories female candidates upper age limit is 35 years. Selection for this Rajasthan Police Sub Inspector recruitment is held in three stages. Examination will be conducted for 400 marks consists of two papers. Each paper contains 200 marks. Physical efficiency tests will be conducted for 100 marks. Physical fit and sufficient educational having candidates can apply online @rpsc.rajastha.gov.in on or before 08-08-2018 and pay the examination fee @ E Mitra centers on or before 08-08-2018. 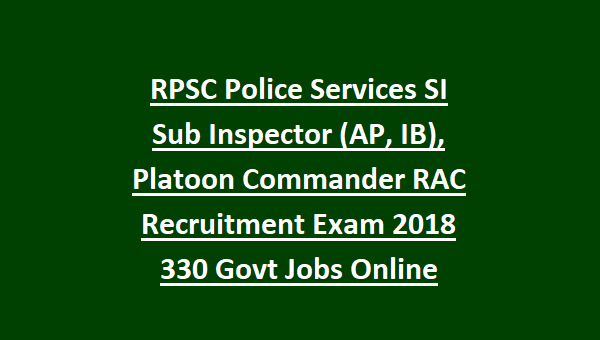 RPSC Police Sub Inspector Recruitment 2018 article to your lovable friends through online via social web. Hi Rajnish AP-Armed Police, IB-Intelligence Bureau.